Whistler Condos: A Friend of mine owns a Condo he rents out and is also an agent for several others. If interested click here. Since my Website is not primarily a Ski site, I do not pretend to be able to do a better job than those which are. My main object is to steer you to the best sources of the specific information you are seeking. This page, therefore, consists mainly of links to specific Ski Resort Websites and also to some other Websites dedicated to Skiing and nothing else. I have, however provided some general information of my own, that I hope you will find useful. I try to update the outlook section above on a weekly basis, at least, and I tend to modify it once or twice during the week to reflect current conditions. British Columbia, Western Alberta and Washington State have some of the finest Ski areas in the world. Whistler is the best known, but there are many other ski areas, most of which are considerably cheaper than the upscale Whistler area. The problem with Whistler is its lack of cheap accommodation , although there is a Hostel there. There are links to other accommodations in the tables below. Whistler can be subject to fog and other adverse weather conditions due to its proximity to the coast. Snow at Whistler tends to be stickier and heavier than that found in the interior resorts. If you are willing to travel a little further inland, you will be rewarded with some of the best powder skiing and snowboarding to be found anywhere in the world at reasonable prices. I'm not trying to discourage you from visiting Whistler. There's no place like it especially if you are into the après ski scene. Just consider visiting some of the other less well known resorts. 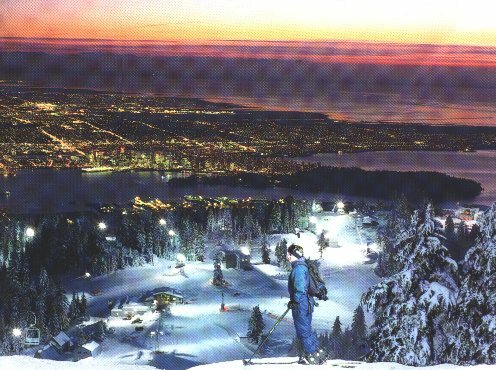 Vancouver city itself, has 3 Top Notch Ski areas all within 30 minutes of downtown, some of which can be accessed by public transportation. They are in order from West to East, Cypress Bowl, Grouse & Seymour. Of the 3, Cypress probably has the most variety, offering Downhill , Cross-Country Skiing, Snowboarding, Snowshoeing & Tobogganing. Rentals are available. Grouse offers Downhill Skiing, Snowboarding, Snowshoeing & Skating. Seymour offers, Downhill Skiing, Snowboarding, Tobogganing & Snowshoeing. Of the 3 mountains, you can only drive up Seymour & Cypress. Grouse requires riding up on a cable car. The only disadvantage to the local mountains as compared to Whistler is the shorter season & unpredictability of conditions. These peaks are at a lower altitude and closer to the Ocean. Generally speaking they are at their prime during January & February. They have the big advantage of being considerably cheaper than Whistler. The Ski season technically ranges from late November to Mid-April depending on Altitude and distance from the Coast. In reality, though, Ski seasons usually run from mid to late December through March with the best Skiing during January and February. Some Ski areas use snow machines to compensate for poor conditions, but these still depend on "below freezing" temperatures. It usually takes until late December before a good base is established in most ski areas. Obviously, the further north you go, and the higher the altitude, the longer the season. If you know of any other links I should add or you run a website on Skiing, E-Mail me and I will add it. Buying equipment & Ski Lessons: Ski Lessons in Downhill, X-Country & Snowboarding are available on nearly all local Mountains (no X-Country at Grouse). In Vancouver, the best place to buy equipment is in the vicinity of Burrard & 4th Ave. There are several outlets clustered in this area, specializing in Snowboards & Skis. For X-Country equipment, your best bet is Sigges in the 2000 block of 4th Ave. They also rent equipment & organize tours. Cross Country Trail on Cypress Mountain, West Vancouver. There are 4 tables below for Current Conditions/Ski Resorts/ Tour Operators and Other Links. The Table below contains links to current Ski Condition Information for most BC and NW Washington State Resorts. I have found them not too good at keeping information up to date at times. Its usually a better bet to visit the website of the particular resort you are interested in in the second table below. There are also Ski Information Phone lines available in Greater Vancouver. Try the talking Yellow Pages at (604) 299-9000, Box 3070. Most Local Mountains also have their own Snow Condition lines. You will find the numbers to these by visiting their websites below. The Table below contains Information on Companies that offer tours to Ski Areas, or activities within those areas. I do not personally endorse any of them. Tour operators in BC are heavily regulated and you will probably be happy with the services of any of those listed below. Note that helicopter skiing can be risky, mainly due to avalanche conditions that cannot always be predicted. Several deaths have occurred over the years due to this activity and you do it at your own risk. Operators make it as safe as possible, but there are inherent risks involved. (Its interesting to note that they usually manage to kill foreigners, rather than locals, maybe tourists get a little more careless). I've already mentioned it before, but be careful about skiing in "out of bounds" areas. They are starting to charge people for their rescue costs in cases where they feel negligence is involved. In some cases this can amount to several thousand dollars. An average of 10-12 people a year die in Avalanches in BC. Back Country & Out-of-Bounds skiing accounts for the bulk of them. In 2003, one incident in January claimed 7 lives, and they were skiing with a reputable operator with an exemplary safety record. In February another 7, this time high school students were killed in another avalanche. If i was a back country skier, I would invest in an airbag backpack, available for about $500 US, it will keep you on the surface of an avalanche. The table below contains links to other Ski Information pages. Unlike this page, these pages are dedicated to Skiing only and will contain more detailed information than I offer on my Web Site.